Recently, Andrew Horowitz decided to do an extremely nice thing and put some rare items up for sale in order to benefit me and my current battles with the American healthcare and welfare system. It’s a long story but the gist of it is: the money I am gifted will primarily be going towards a gap of unemployment that I must endure while I wait to get approved (hopefully) for Disability. I will also be needing money in order to pay off medical bills for some big surgeries coming down the pike, including a heart transplant — if all goes according to plan. You can read more about my story here. Anyway, in order to raise money, Andrew auctioned off one of his Green ties. He also included a handful of very rare CDs including a copy of Tally Hall’s “Partyboobytrap EP” — which I’ve never even SEEN before! There was trouble with the first sale as the buyer never paid up, but Andrew re-listed and it sold the other day for $600! Not long after, an old friend of the band from Quack Media (their record label), Zach Curd, decided to auction off a test printing of Good & Evil! That auction is still ongoing as of the writing of this piece and is going for $505! The proceeds, once again, are going towards my fundraiser. 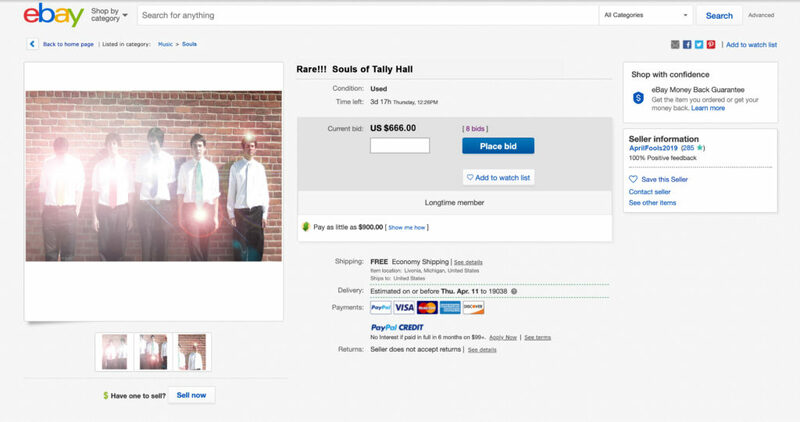 Now, in a very surprising move, all members of Tally Hall have joined up for one final auction to benefit me and I couldn’t be happier. GUYS… THEY ARE SELLING THEIR SOULS! The bidding (get it?) has started and is already up pretty high. How much would YOU pay? RETRACTION: Tally Hall on Broadway?